Henry was born at the end of 1806 at Bradford Abbas, just south of Yeovil, and was the son of schoolmaster John Custard and Mary née Marsh. He was baptised at Bradford Abbas on 11 January 1807. At Poole, Dorset, on 16 June 1833, at the age of 26, he married Mary Goss, the daughter of Joseph Goss and Jane née Stubbington. Henry and Mary were to have five children; Jane Goss (b1833), Henry Marsh Jnr (b1835) who initially dabbled in photography, became an artist and died in Rome at the age of 28, Mary born 1837, George W born 1839 and Walter Goss born 1841. Henry Marsh Custard originally ran a printing business at Parkstone, Dorset but ceased printing there at the end of December 1838 and moved to Yeovil. 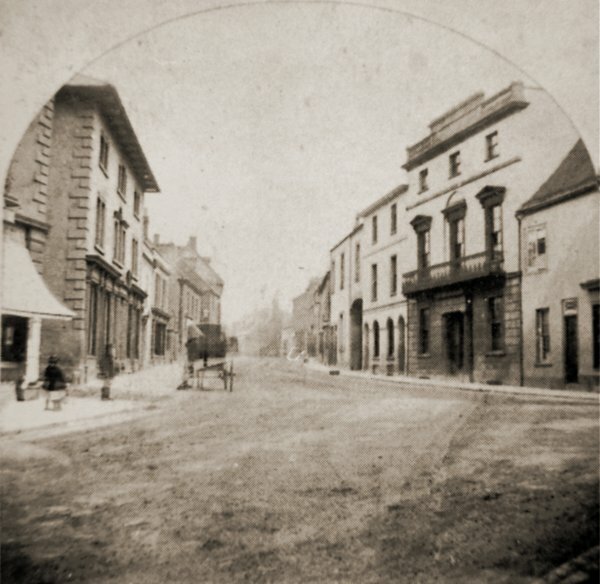 By 1839 Henry was in partnership with William Porter as stationers and printers in Hendford (as this part of Princes Street was then known) in a building, photographed below, on the corner of what was known as Porter's Lane and, later, Custard's Lane (and later still to be widened and to become Westminster Street in the 1930's). Porter & Custard, printers, remained in the premises at least until their partnership was dissolved in 1841. By 1866 Kelly's Directory was advertising the business being run by William Henry Coates. The building itself, which survives today, is almost certainly 18th century and is a three storey, three window stucco corner block with wide eaves and paired brackets. Fenestration is mostly two-light sashes with stone architraves and keystones. The central first floor 'Venetian' window is of note although it has been ruined by the removal of the glazing bars. Two small round-headed windows on the first floor face Westminster Street while the ground floor has modern shop fronts. A blue plaque on the premises commemorates William Porter but sadly omits any mention of the probably more notable Henry Marsh Custard. Henry was an entrepreneurial printer and publisher who also ran both a library and newsroom. He was influential in local Yeovil affairs and served as Portreeve in 1851 and 1852 and became manager of the Savings Bank. Henry was elected Churchwarden at St John's church in 1857, 1858 and 1859 at the Vicar's nomination. Henry was a Freemason, initiated into the Lodge of Brotherly Love in Yeovil on 24 February 1858 at which time he gave his occupation as an Artist. Henry, Mary and their three eldest children, together with Mary's sister Jane, two printer's apprentices and two domestic servants were listed in the 1841 census living above the premises on the corner of Porter's Lane. Henry gave his occupation as printer. In the 1851 census Henry was listed as living at the Savings Bank and gave his occupation as 'bookseller employing 9 men and apprentices'. Living with him above the bank were Mary, their five children, Mary's mother and sister, three bookseller's apprentices and a housemaid. During the 1850s Henry was in partnership with his son-in-law Henry Wippell as printers, booksellers and law and general stationers. The partnership was dissolved by mutual consent on 31 December 1859 and notice was given in the London Gazette. Mary died in the summer of 1857 and in the 1861 census Henry, aged 54 and a widower, described his occupation as accountant and was living in Princes Street with his son George and a domestic servant. 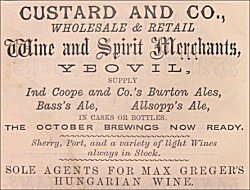 During the 1870s Henry was in partnership with his son George Waldron Custard as wine, spirits and ale merchants under the name of Custard & Co. The partnership was dissolved by mutual consent in March 1879 after which George Custard carried on the business on his own. In the 1891 census Henry was listed at 25 Princes Street. By now he was aged 84 and described himself as a 'Gentleman'. He was living with his accountant son George and his family as well as a general domestic servant. Henry Marsh Custard died in the autumn of 1895 aged 89. 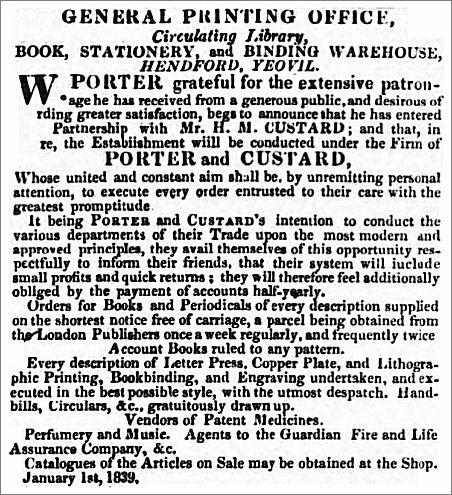 A notice placed in the 10 January 1839 edition of the Somersetshire Gazette announcing the partnership of Porter & Custard. It is interesting to note (at the bottom of the advertisement) that a sideline was dealing in 'Patent Medicines, Perfumery and Music'. This photograph of Princes Street dates to around 1875 and is one half of a stereoscopic pair. It was taken at the time Henry Marsh Custard was running his bookshop / printer's / stationers which was situated in the three-storey building to the left of the cart in the photograph. The narrow lane seen between Custard's building and the building at extreme left was colloquially known as Custard's Lane and later widened to become Westminster Street.